Is the future heavenly or hellish for Eleanor Shellstrop and the gang? Has The Good Place TV show been cancelled or renewed for a fourth season on NBC? The television vulture is watching the latest cancellation and renewal news, so this page is the place to track the status of The Good Place, season four. Bookmark it, or subscribe for the latest updates. Remember, the television vulture is watching your shows. Are you? After pleading their case to the Judge (Maya Rudolph) in the season two finale, the gang is given a second shot a living a good life. Season three finds them back on Earth. Separated and retaining no memory of one another their task seems insurmountable, until they get a little help from Good Place architect Michael (Danson) who, along with not-a-robot Janet (Carden), is watching over them from afar. The third season of The Good Place averaged a 0.85 rating in the 18-49 demographic and 2.75 million viewers. Compared to season two, that’s down by 26% and 29%, respectively. Compare its standing to the other NBC TV shows we are tracking. On December 4, 2018, The Good Place was renewed for a fourth season, with a start date TBD. Stay tuned for further updates. Will NBC cancel or renew The Good Place for a fourth season? Despite lower ratings, I think it will score a renewal. Creator Mike Schur has a lot of good will built up at the Peacock Network, and this comedy has bred a devoted fanbase. Still, the series is a long way off from having enough episodes for a syndication package. I’ll keep a hungry eye on the Nielsens and update this page with breaking developments. Subscribe for free updates on any cancellation or renewal news regarding The Good Place. What do you think? 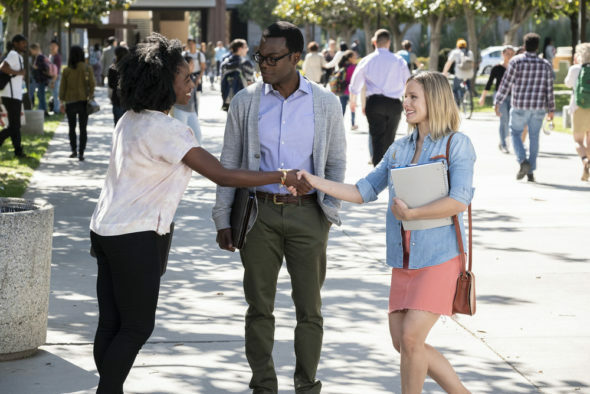 Should NBC have cancelled or renewed The Good Place TV series for season four? How many seasons would you like this NBC TV show to run?